Plovdiv High School of Art “Tsanko Lavrenov” celebrates its 30th anniversary. Meeting of all the former 983 students of the high school is scheduled to take place in the Artists’ Union exhibition hall at Gladstone Street. 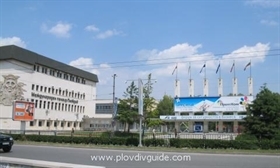 The high school was created in April 1976 after some of the most eminent Plovdiv artists – Zlatyu Boyadzhiev, Ioan Leviev, Hristo Stefanov, Dimiter Kirov – as well as the Plovdiv community have long worked in favor of such a school in the city….